The district will include suicide awareness and prevention in already established district or building crisis response teams or will establish such team(s) if not already in existence. Crisis response team members will include administrators, counselors and the school nurse, and may also include school social workers, school resource officers, teachers and/or community resources as appropriate. The crisis response team will be responsible for implementation of crisis response procedures. The district will adopt an evidence based/informed tool for assessing suicide risk. The crisis response team, the building administrator, or his/her designee will receive training and coaching in using this tool to collect and document student suicidal behaviors and safety planning strategies. Student suicidal behaviors are not confidential and may be revealed to the student’s parents, guardians, school personnel or other appropriate authority when the health, welfare or safety of the student is at risk. Any school employee who has a reasonable belief that a student may be at risk for suicide or witnesses any attempt towards self-injury will notify a member of the crisis response team, the building administrator or his/her designee. 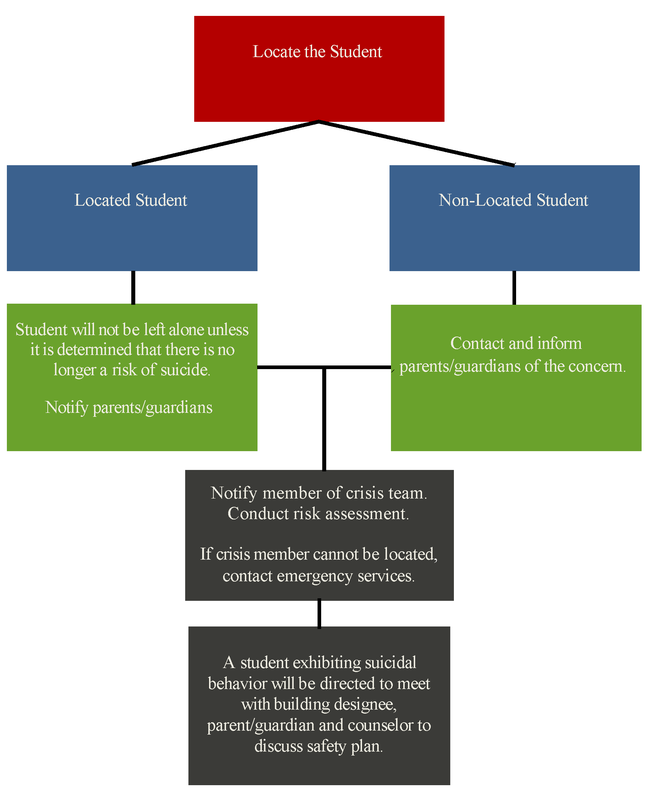 If a student suicide behavior is made known to any school employee and a member of the crisis response team, the building administrator or his/her designee is not available, the employee will notify the student’s parent/guardian, the National Suicide Prevention Lifeline (800-273-8255) or local law enforcement in an emergency situation. As soon as practical, the employee will notify the building designee or principal. A member of the crisis response team, the building administrator or his/her designee shall reach out to the parents/guardians of a student identified as being at risk of suicide to consult with them about the risk assessment of their student, to make them aware of community resources, and to discuss how to best support the student’s mental well-being and safety. If the parent refuses to cooperate or if there is any doubt regarding the student’s safety, local mental service providers and/or law enforcement may need to be engaged, and a report may need to be made to the Child Abuse and Neglect Hotline. Contact with a parent concerning risk of suicide will be documented in writing. A student exhibiting suicidal behavior will be directed to meet with the building designee, their parent/guardian and counselor to discuss support and safety systems, available resources, coping skills and a safety plan as necessary. The district will, in collaboration with local organizations and the Missouri Department of Mental Health, identify local, state and national resources and organizations that can provide information or support to students and families. A basic list of resources can be found on the Department of Mental Health website and the district will strive to develop its own list of local resources to be made readily available. When the school community is impacted by suicidal behavior or a death by suicide, the district will confer with their crisis response teams and, when appropriate, confer with local community resources and professionals to identify and make available supports that may help the school community understand and process the behavior and/or death. The crisis response team, the building administrator or his/her designee will determine appropriate procedures for informing the school community of a death by suicide and the supports that will be offered. Staff and students who need immediate attention following a death by suicide will be provided support and resources as determined necessary. All district employees will receive information annually regarding this policy and the district’s protocol for suicide awareness, prevention and response. The importance of suicide prevention, recognition of suicide protective and risk factors, strategies to strengthen school connectedness and building specific response procedures will be highlighted. All district staff will participate in professional development regarding suicide awareness and prevention. Starting no later than fifth grade, students will receive age appropriate information and instruction on suicide awareness and prevention. Information and instruction may be offered in health education, by the counseling staff or in other curricula as may be appropriate. The district will notify employees, students and parents of this policy by posting the policy and related procedures and documents on the district’s website and discussing this policy during employee training as detailed herein.